Last week, we started to see large flocks of long-billed corellas on the way to school. There were over 500 in the flock and there were so many that it looked like there was snow on the ground and in the trees. These beautiful birds grow to about 40 cm long. They are mostly white, with small red patches on their face and chest, and blue skin around their eyes. They get their name from their long beak that they use to dig around for roots, bulbs and seeds. These beaks can also cause a lot of damage as they eat the grass on golf courses and sporting fields, and chew roofs, power lines and even the edges of roads. At breeding time, long-billed corellas lay 2-3 eggs in a tree hollow. Both the males and females prepare the nest, incubate the eggs and feed the chicks. They are very noisy birds and when kept in captivity are excellent talkers. They can learn whole sentences and are considered the best talkers of all of the cockatoo family. 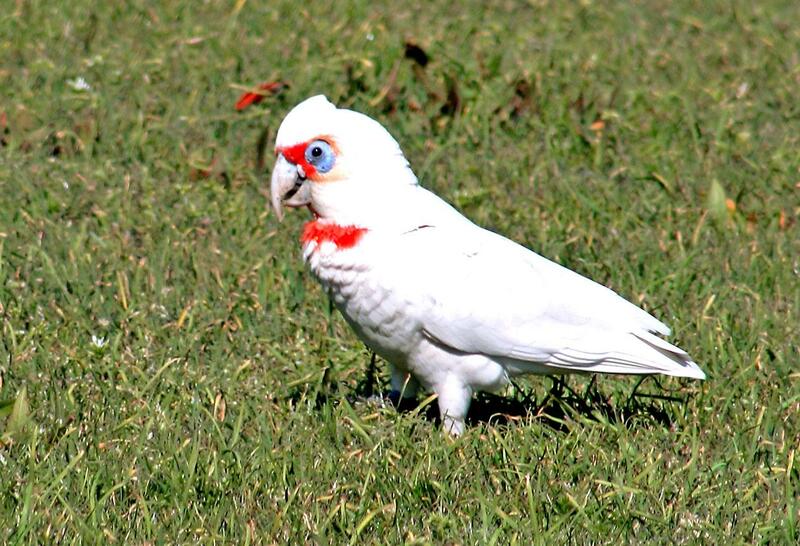 Long-billed corellas are very common and can be found in open areas throughout Victoria and New South Wales in south eastern Australia. They have also been introduced to other parts of Australia where they are becoming a pest. Are there any other interesting facts that you would like to share about long-billed corellas?